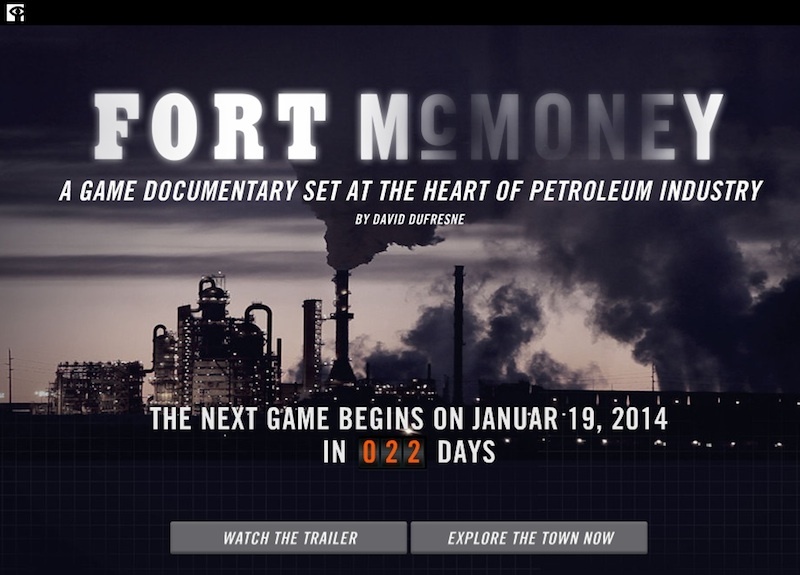 Described by the New York Times as “where film marries video game”, Fort McMoney is a documentary game that explores the often dire consequences a booming petroleum industry has on a midsized Canadian town called Fort McMurray. 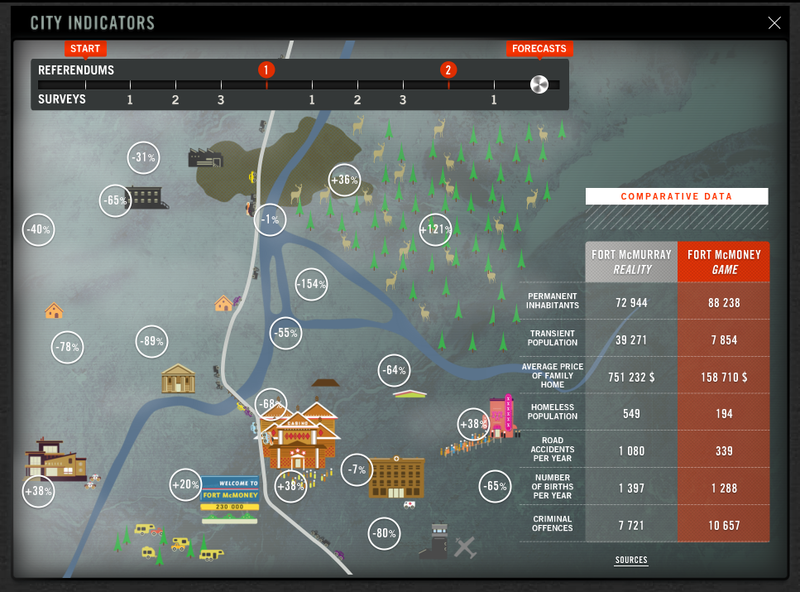 Launched in 2013, this educational simulation functions as a collective experience in real time. Players are challenged to explore a digital incarnation of Fort McMurray, speak to the locals, investigate the effects of the petroleum industry, debate these findings with thousands of other players online and then cast votes in a number of in-game referendums. These referendums consist of questions like, “Should petroleum companies pay more royalties?”, with the results influencing future gameplay. Whilst there are vague parameters guiding a player’s progress through the game, users are able to explore as much or as little content as they like. Comprising significantly of short film packages, there is a total of nine hours of video content to be explored across 22 locations and 55 real-life characters, including oil lobbyists, political figures, indigenous leaders and environmental activities. Although Fort McMoney is fundamentally rooted in a geographical location and thus postulates a corresponding set of location-specific concerns and circumstances, the documentary does garner some broader appeal. 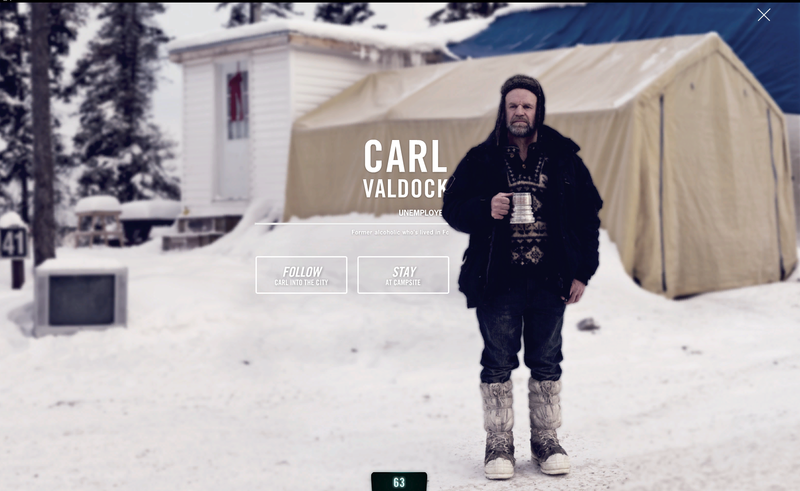 Firstly, Fort McMoney is available in three languages (English, German and French) and can be accessed for free across the globe on the National Film Board of Canada website. However, whilst Fort McMoney can be played anywhere in the world, it is best suited for people situated near a Canadian time zone. Effective collaboration and debate between players proves difficult when you live in a country that is 13 hours behind the majority of the game’s players. Secondly, industry-towns are a common phenomena, and are often demarcated by similar environmental, infrastructural and political issues explored in the game. Fort McMoney appeals strongly to any resident or worker in an industry town who has faced similar experiences and, more broadly, anyone curious about the significance these powerhouse-towns have in a national economy. It also appeals to those with an interest in environmental preservation. Whilst the debate and communal decision making aspect of Fort McMoney is imperative to its success, the technical composition of the game directly targets and enhances a user’s personal experience. The numerous film packages and interviews are thoughtfully composed, the panoramic photographs of various sites within the town are artistically framed and the ambient soundtrack that varies from location to location powerfully immerses the user into the virtual reality of the game. Whilst there is much visually and sonically to praise, the technical extravagance of the game has its consequences. The numerous video packages on which Fort McMoney relies demand high bandwidth, a fact scarcely pacified by the ability to adjust to a lower/higher level of definition. Furthermore, there is often need for prolonged loading periods before and after each video package. Whilst waiting was frustrating enough (my attention often diverting to another website), the loading took place on a black, blank screen, giving no indication of how long the load would take or whether the program had malfunctioned (I was forced to refresh the game on several occasions). Fort McMoney exists as a standalone, online multiplayer game with no broadcast or non-online supplement. Whilst the documentary has more than enough video footage and content for a feature length documentary film, the strength of the project lies in its viewers’ ability to shape and experience the available content in whatever form, length and sequence they desire. Any non-linear, passive replication of the documentary would undermine its core intention of individual and community engagement with the production’s prevailing issues and concerns. Fort McMoney has a relatively user-friendly interface in which players use the mouse to scan various panoramic locales, clicking on characters they wish to talk to and using buttons to travel to different areas of Fort McMurray and its surrounding suburbs. The game has an illustrated manual that clearly and concisely explains gameplay, as well as an introductory video that provides both a thematic exposition and instructions on how to navigate the digital environment. Additionally, a dashboard at the bottom of the screen provides a range of tools, maps and information to assist users at any point in the experience. Whilst navigating the digital environment is relatively straightforward, some areas of the game can be difficult to access and confusing. All routes through the documentary are not initially or always available (these are unlocked periodically and via choice in gameplay) which can cause users to become frustrated and without clear indication on how to access further content. This can be overcome by opening the dashboard where users can ask other players for assistance or use the ‘missions’, ‘progress’ and ‘inventory’ tabs to uncover clues leading to additional courses of exploration. However without prolonged play, this dashboard can appear convoluted and confusing as it features a great deal of graphs, maps, information and tools. Although the huge landscape and directionless gameplay can off-put first time users, it is somewhat of a necessary evil to the game. Fort McMoney puts the user in the shoes of the documentarian. You are sometimes derailed and lost, but it is your job to find clues, decide which characters to speak to and let your curiosity steer you to the truth behind the petroleum industry. You can even interview certain characters, electing to ask one of several provided questions, each question steering the conversation in a different direction. It is at times irritating, but you are rewarded by your curiosity (see below) and the more time users invest in the game, the more likely they are to try and figure out how to proceed. 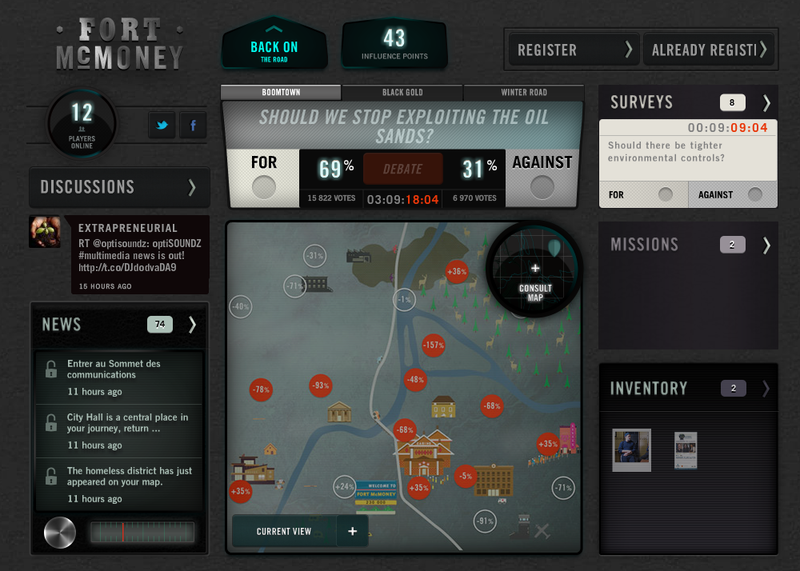 Fort McMoney is played in four-week cycles, with players answering referendum questions like, “Should social service agencies get more funding”. These results affect other players and the condition of the town. For example, Fort McMoney’s first cycle saw players vote to cut petroleum output to reduce greenhouse gas emissions. Consequently, the town’s population dropped from 40,000 to 4,000, unemployment soared to 28% and household income dropped dramatically. To ensure sincere voting, each player’s vote becomes more powerful the more sites they visit, characters they talk to, votes they participate in and discussion they have on various social networks. 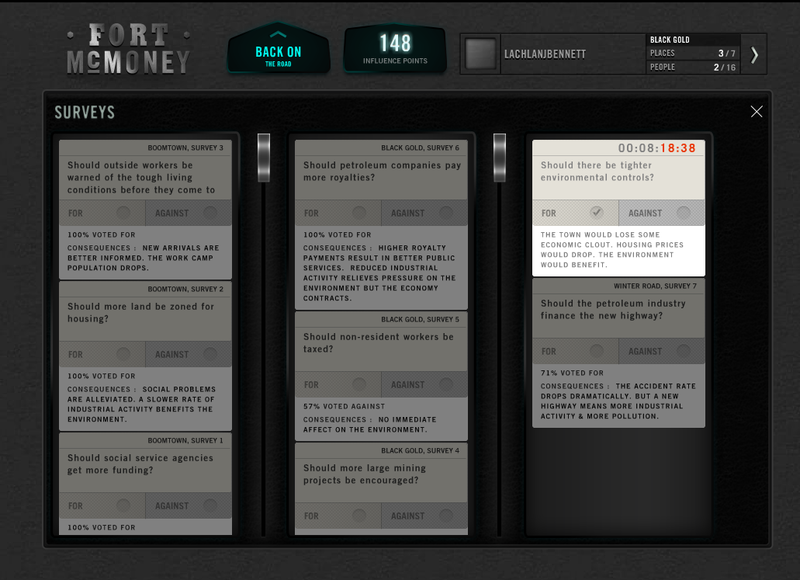 Additionally, players can debate referendum questions with others using in-game and third party material. The collective gameplay element is one of the strongest features of the documentary, not only encouraging continual engagement with the game but also advocating greater civic responsibility among its users. However, the success of the voting system and the overall gameplay relies on the number and quality of its users. Users can obtain greater influence in voting without comprehensively exploring the game, opting to visit sites and skip videos just to collective influence points. Additionally, the sheer mass of users results in significant online noise, making effective debates occasionally difficult.